Production delays cost money and directly impact the bottom-line profitability. Kitting and staging are critical in the lean manufacturing process when processing parts, saving time, and eliminating production delays. Manufacturing assembly areas must be coordinated with flexible, custom-built, modular tubing defined by the specific task at-hand. Operations manage time and sequence components and parts needed for manufacturing a particular SKU. Creating kits of needed parts is supported by mother-daughter carts that drop off the needed materials. This efficient assembly process ensures that stock levels are just-in-time, avoiding shortages and production delays. A kaizen event of the production process will quickly show where there are production delays. Labor waiting for parts is a disaster. Where manufacturers have been measuring OEE (overall equipment effectiveness), the reality is that employees waiting for parts is a metric of OEE (overall employee effectiveness). By implementing pick and loaded carts as required in production sequencing, components kits delivered to modular Topper Tube configurations make necessary parts available at the exact point needed on the production line. The reduction of time taken in processing parts and elimination of production delays can be quantified in a post-kaizen repeated event. Quick assembly of these modular solutions is a time-saver. With highly customizable full line of accessories, manufacturers realize a boost in production efficiency by upwards of 40 percent. High quality casters can be fitted for portability and the industries’ highest capacity racks also have a longer lifespan than comparable Creform configurations. From flow racks to a range of unique, flexible, and reusable lightweight tubular components, brackets, castors, and accessories the various sizes and shapes are customized to serve a variety of manufacturing processes for moving components, products, materials handling, and mobile storage. 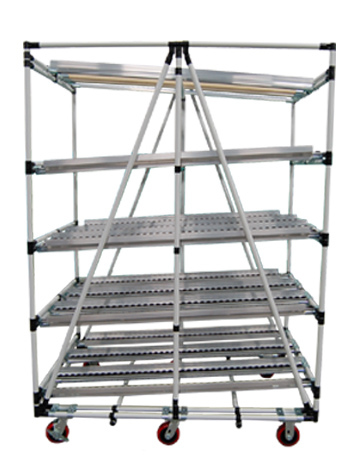 These modular flow racks are ideal for lineside and sub-assembly applications. Flow racks in manufacturing cells increase space utilization by up to 60 percent, creating valuable work space at all assembly lines. When coordinated with the proper industrial carts, tilted pick trays angles totes or parts towards the worker, resulting in an increase in efficiency while maintaining the best ergonomic principles. Where repetitive SKUs are present, these modular tubing solutions can be made into permanent structures. When there is production variety, seasonality, or frequent manufacturing changeovers, modular tubing solutions are reconfigured and reassemble maximizing lean effectiveness and efficiency. This capacity to address changing process requirements immediately alters the calculation for TCO (total cost of ownership). Reuse of these modular solutions is a gamechanger in calculating the value proposition.